This kit consists of 25 different warrior class weapons. It comes with two variations of textures. (Clean and used/damaged). 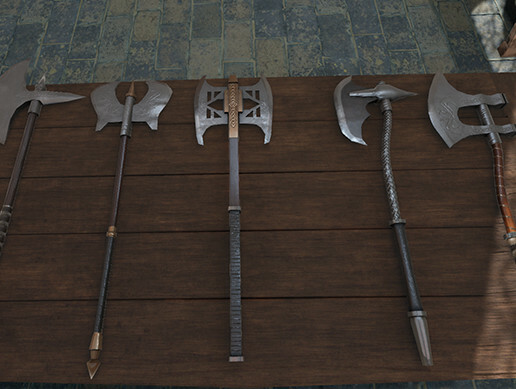 The weapons are in two forms Static Mesh and Skeletal Mesh. The Skeletal Meshes have multiple joint locations to offer a difference in grip style. It is a great kit for building gear systems and expanding existing weapon sets. The kit also comes with the set used to take the photos. The set is part of a larger great hall kit coming soon. but the meshes are still clean and ready to use. Not included is the Fire particle. Everything else in the images is included.